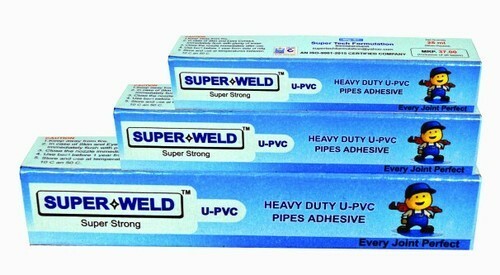 To meet huge market demands, we are involved in presenting a huge assortment of Heavy Duty UPVC Pipe Adhesive. This UPVC Adhesive is sturdily constructed by the experienced professionals of our company. This UPVC Adhesive is known for its high reliability as well. Super Tech Formulation has created a reputed position in the market. Located our operational head at Ahmedabad - 382415, Gujarat, India. Our company is engaged in manufacturing and supplying wide range of PVC Adhesive, UPVC Adhesive, CPVC Adhesive and Pipe Adhesive etc. We are a leading organization and ensures that our product range comply with the national quality standards. We have a separate quality testing department that helps us ensure the flawlessness and superiority of the products. Further, our high-tech infrastructural unit is supported with latest and advance technologies that enable us to have superb quality production in the organization. Our facility is segregated into various departments which are managed by our team of professionals. Our experts make sure that the products are manufactured by using latest technologies and excellent quality material. The material is procured from the best and authentic merchants of the market.